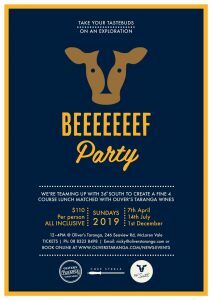 The Oliver’s Taranga cousins are doing us proud rearing beef and collaborating with 36 ° South- Tey’s meats in the South East of South Australia. Not only are they producing the finest cuts of meat we are proud once again to report that all the cattle is reared and handled with the best animal welfare as a priority. A four course lunch starring our very south east Oliver raised on-a-spit matched with a selection of Oliver’s Taranga Wines. These are very popular events- so get your mates together and book early! When a business provides good service, I think it’s really important that their customers let them know. My wife and I were at your Beef Party yesterday, and I have to say that we did not have a good experience; we had an AWESOME experience! From the moment we arrived and received our first glass of wine, to the moment we left, everything was perfect. It was great to hear from the Oliver’s Taranga family members as well as staff and suppliers. The food was just incredible (as was the wine). Fabulous entertainment, great, attentive staff. I could not recommend this experience highly enough. A very big thankyou to all concerned. See you next time.